This amazing dome home is unlike any other we’ve seen in New York, or anywhere in the USA for that matter. Located 80 miles outside of NYC in New Paltz, the rounded house looks like a wooden spaceship that has touched down in the middle of a 28-acre forested plot. This particular dome home is a prefab model, coming from the France-based company DomeSpace. The unique residence was shipped to the site and constructed over the course of three months before becoming a vacation home for the original owners. The wooden dome house is constructed largely from organic materials, including cedar, bamboo, and limestone. It has another eco-friendly feature, too, that allows the home to be more energy-efficient in a very peculiar way. Much like the sci-fi flying saucers it shares its shape with, this house can spin. At the push of a button, the entire home can rotate, allowing the owners to take fullest advantage of the sun (or shade) in any part of the house. The round, two-level home has very few interior walls, so there’s lots of usable space. The openness, combined with the serene surroundings, conveys an almost sacred feeling for guests. The wood-clad walls arch upward and meet in a single point at the center of the home’s 40-foot ceiling, which simultaneously reminds of a cathedral and a sauna. This amazing structure tucks three bedrooms, two and a half bathrooms, a full kitchen, library, and office into just 2,300 square feet, without feeling remotely cramped. Its relatively open floor plan and enormous curved windows work together to create the illusion of an expansive estate, all neatly packaged within the dome. Oh, and it’s for sale. 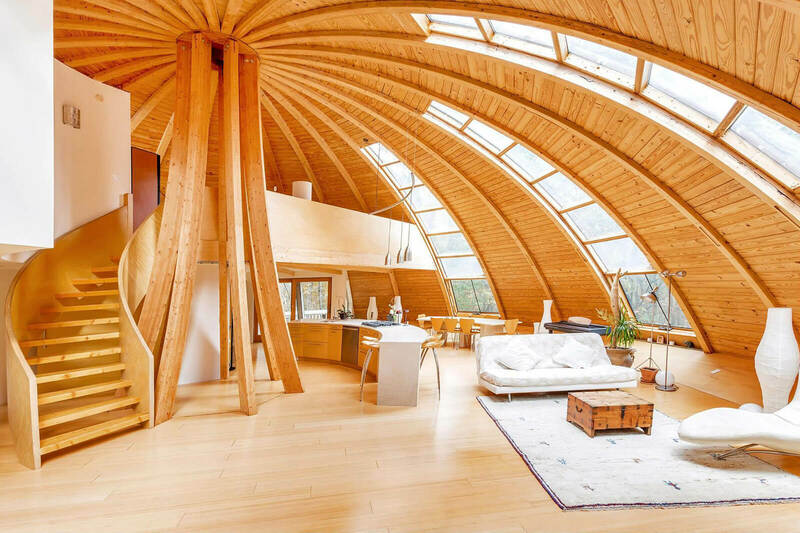 This beautiful, curvaceous, rotating home can be yours for less than a cool million – in fact, prices were cut recently to just $899,000.